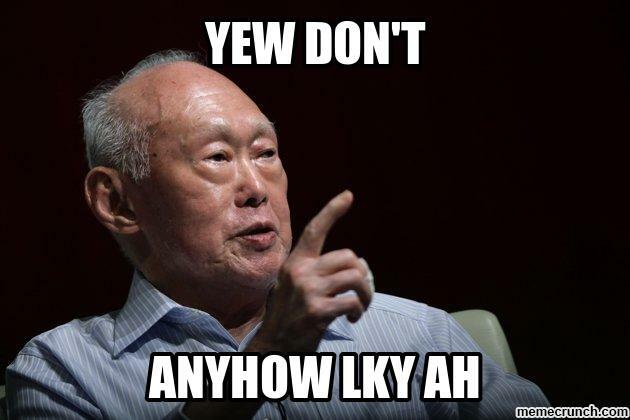 Goodbye LKY memes, we’re sure you know which meme. The name or image or likeness of Mr Lee Kuan Yew may be used for purposes of identifying with the nation, including on works of art or publications or items for charitable purposes, in accordance with law. The name or image or likeness of Mr Lee Kuan Yew should be accorded dignity and respect. The name or image or likeness of Mr Lee Kuan Yew should not be used for commercial exploitation or be assumed or taken to indicate any kind of official endorsement of products or services. Singaporeans from all walks of life have expressed confusion, frustration and disappointment at the MCCY’s new guidelines on the usage of the late Lee Kuan Yew’s name and image. Eager to stay ahead of the pack in early childhood education, Ms. Eugenia Wai has founded a kindergarten that will prepare the next generation of Singaporeans for nation-building. The LKY Preschool of Political Science aims to introduce gifted toddlers to the thrilling world of political ideology, policymaking and pointless rally speeches which have no bearing on actual electoral performance. With her carefully curated syllabus, Ms. Wai hopes that she can help nurture a new generation of leaders from an early age. Ms. Eugenia Wai revealed that she is a fan of the somewhat ill-conceived Graduate Mothers Scheme. Ms. Wai has designed a syllabus that is 50% fieldwork, 20% theory, and 30% handshaking, planting trees, and kissing babies. She feels that there is no need to have a higher proportion of coursework devoted to political ideology, as several political parties in Singapore still think that “give people a chance to vote” is a real political ideology. She plans to guide the first batch of students as they form the STD (Singaporean Toddler Democrats) political party for their final year project. Ms Wai has appealed to the MCCY for approval of her preschool name. Jackson pointed out that his WWLKYD merchandise would help the nation identify with LKY and itself, and thus should not be banned. He added that asking yourself what LKY would do in any situation is the same as asking what Singapore would do, because Singapore is, in fact, Lee Kuan Yew. Jackson has no immediate plans to appeal to the MCCY so that he can sell his WWLKYD merchandise. However, he is fully committed to complaining loudly and lengthily to all of his friends and several unwitting strangers about this unfair regulation at all opportune moments. Disclaimer: This anyhowly article is for entertainment only. Don’t say I never say, hor.